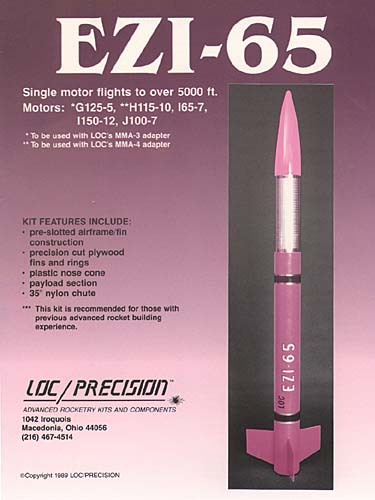 The Loc/Precision EZI-65 kit is the rocket I built for my Tripoli level 2 certification. This is a high-performance rocket which is reasonably stable and flies well on I and J motors. 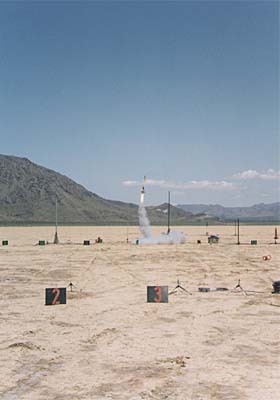 The rec.models.rockets community seemed to favor the Loc/Precision EZI-65 as the ideal level 1 certification rocket. However, I'd already purchased the I-ROC and since it has a 38mm motor mount, it seemed more appropriate for level 1 (H and I motors). The EZI-65 flies on I and J motors (it has a 54mm motor mount), which is just up into the level 2 range. 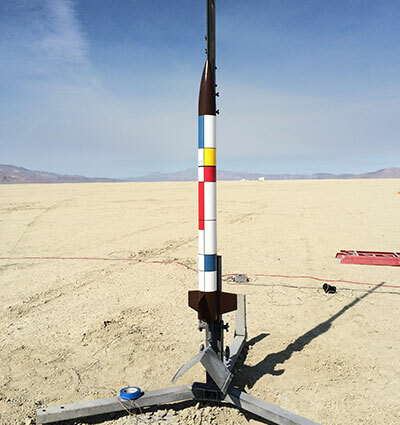 I shredded the original rocket attempting my level 2 certification, but a rebirth was completed as a Rocketry Online How-To Classroom forum series (sadly now lost). In 2014, Loc updated the kit with some changes I'd suggested in my article. That plus AeroTech re-releasing the I65 as a DMS motor made me decide to build this rocket a third time, as the example for my Level 2 in Style video. On the left is the original EZI-65, built as per the kit instructions. In the center is the rebuilt "level 2" version: fiberglassed, with dual-deployment and a better copy of a Mondrian painting. On the right is the second rebuild, done in August 2014. On its maiden flight, the EZI-65 shredded spectacularly. 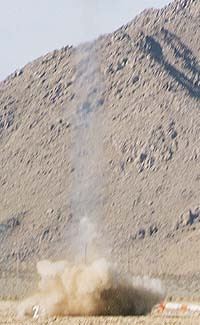 It appeared to disintegrate about 100 feet off the ground. We never figured out why it shredded--perhaps a fin came off. 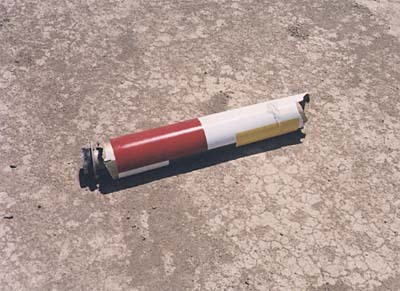 The tail of the rocket was never recovered, although we did find the undamaged nose later. 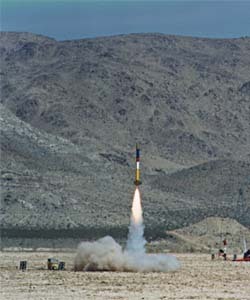 The EZI-65 launches, apparently perfectly, sporting wild modern art colors. Not much was recovered. A shred doesn't leave much. The rebuilt EZI (now the EZI-130) flew for the first time at ROC-stock in Lucerne Valley, CA on November 15th. The spectacular flight on a J800 will not be the last! 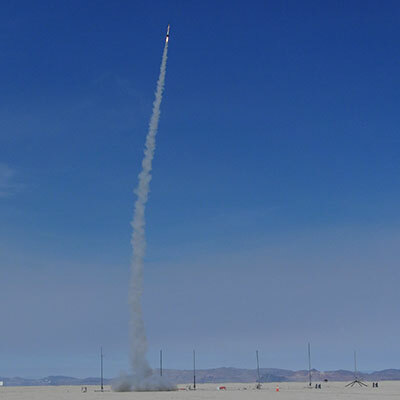 The flight was dramatic, with a total altitude of 6322 feet (as measured by the Missile Works RRC2). 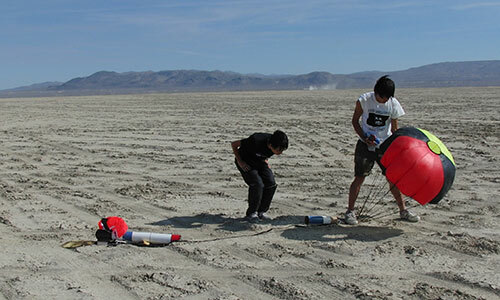 The parachute never fully came out of the payload section (as you can see in the picture below), but the strong construction of the rocket saved it as it came down, braked by the three sections of its dual deployment. Next flight will be with a smaller parachute which will fit more easily into the payload section. Too bad there's not enough room for a piston. Isn't it nice to have those recovery helpers? 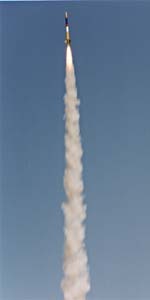 The rocket flew again under its informal name of Mondrian at the ROC-stock launch on June 13, 1999. This time, I decided to go for the big 'un and fly it on a K550. 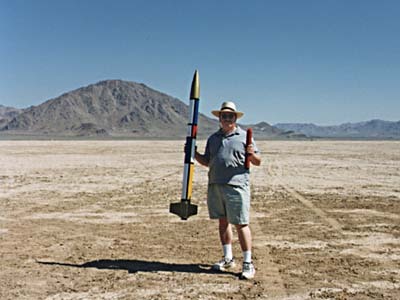 You can see me posing with the rocket and the motor. We're all ready to go! The EZI landed at the edge of the lake almost in the sage. We did manage to recover it after about a half hour of looking. Unfortunately, the landing had jarred the battery out of the Missile Works on-board battery holder, even though I had added a tie strap. So, I don't know what the altitude was, although it must have been almost 10,000'. Some black powder smoke got into the altimeter bay and the rocket is showing wear and tear due from the hot shot flights it's made, but is still in service. A very successful adaptation of the Loc/Precision kit to serious level 2 power! The how-to video was completed in early September 2014, and the next launch I attended was XPRS. The once-again-rebuilt EZI-65 flew twice on September 11 & 12. After making the level 2 video, I wanted to demonstrate that even the enhancements made wouldn't stop it from flying on its signature motor, the Aerotech I65, so the first flight was on the DMS reissue of that same motor. 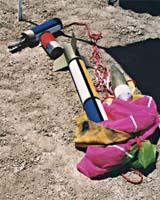 Above is the prepped rocket posed with the motor, still in its packaging. 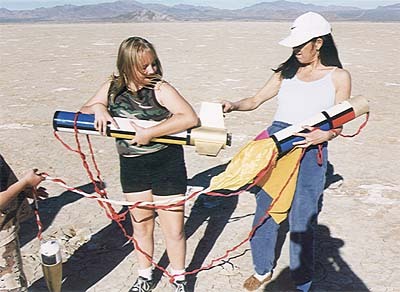 Of course, this is a very low-thrust motor, so make sure you use a long enough launch guide. I used one of the longer rails for this one, even though the motor is only an "I". 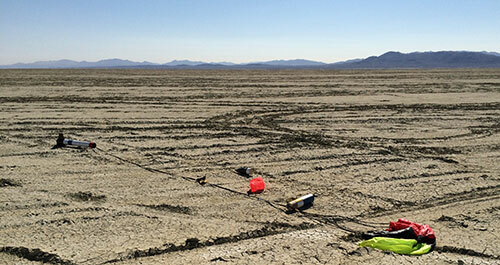 And the final pretty shot, above, before the first landing on the playa. 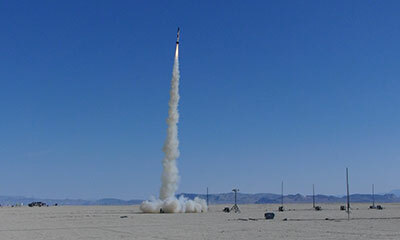 There was a light wind on Thursday September 11, but nothing too bad, so the rocket headed slightly upwind at take off, but otherwise had a perfect flight. Despite the atypical dual deployment configuration, it worked pefectly with two #2 Nylon screw shear pins and the rocket landed just past the the end of the flight line. Above you can see two curious students from the ARLISS launch inspecting the rocket on the ground. Success on an I! It still works on the I, but how about a level-2 motor? I decided to give the new K535 single-use motor a try. This is a solid level-2 motor: a "K" with over 600N thrust for the first half of its burn. The next morning, I flew the rocket again. Above you can see the rocket prepped and the K535 package next to it. This time there was no need for a long rail, so I flew it off the mid-power (250') pads. A much faster boost this time, although a much shorter burn. Dual-deployment worked pefectly again, this time a bit farther down range due to the higher altitude and winds aloft. 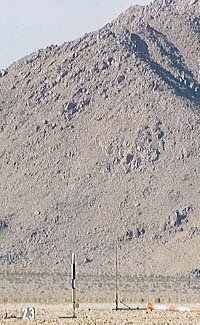 Above you can see the rocket laid out pefectly on the ground. Success on a K! Note that this rocket broke Mach 1, so clearly cardboard is a fine material for level 2 rockets. The instructions for this kit were standard Loc/Precision: just enough information on the back of the kit card. The color scheme they chose is hideous, so I decided to go wild on this rocket and do it as modern art as you can see. The Krylon Brass metallic paint is pretty neat, but requires ultra careful preparation as it shows defects even more than white. Also, my paint job came out much flatter looking (even with a Crystal Clear coat) than the cap on the can.